"SuperSpeed" redirects here. For other uses, see Super Speed. USB 3.0 is the third major version of the Universal Serial Bus (USB) standard for interfacing computers and electronic devices. Among other improvements, USB 3.0 adds the new transfer rate referred to as SuperSpeed USB (SS) that can transfer data at up to 5 Gbit/s (625 MB/s), which is about 10 times faster than the USB 2.0 standard. 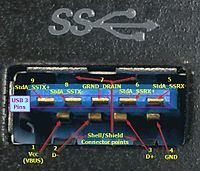 It is recommended that manufacturers distinguish USB 3.0 connectors from their USB 2.0 counterparts by using blue color for the Standard-A receptacles and plugs, and by the initials SS. USB 3.1, released in July 2013, is the successor standard that replaces the USB 3.0 standard. USB 3.1 preserves the existing SuperSpeed transfer rate, giving it the new label USB 3.1 Gen 1, while defining a new SuperSpeed+ transfer mode, called USB 3.1 Gen 2 which can transfer data at up to 10 Gbit/s over the existing USB-type-A and USB-C connectors (1250 MB/s, twice the rate of USB 3.0). USB 3.0 has transmission speeds of up to 5 Gbit/s, about ten times faster than USB 2.0 (480 Mbit/s) even without considering that USB 3.0 is full duplex whereas USB 2.0 is half duplex. This gives USB 3.0 a potential total bidirectional bandwidth twenty times greater than USB 2.0. Front view of a Standard-A USB 3.0 connector, showing its front row of four pins for the USB 1.x/2.0 backward compatibility, and a second row of five pins for the new USB 3.0 connectivity. The plastic insert is in the USB 3.0 standard blue color known as Pantone 300C. In USB 3.0, dual-bus architecture is used to allow both USB 2.0 (Full Speed, Low Speed, or High Speed) and USB 3.0 (SuperSpeed) operations to take place simultaneously, thus providing backward compatibility. The structural topology is the same, consisting of a tiered star topology with a root hub at level 0 and hubs at lower levels to provide bus connectivity to devices. The SuperSpeed transaction is initiated by a host request, followed by a response from the device. The device either accepts the request or rejects it; if accepted, the device sends data or accepts data from the host. If the endpoint is halted, the device responds with a STALL handshake. If there is lack of buffer space or data, it responds with a Not Ready (NRDY) signal to tell the host that it is not able to process the request. When the device is ready, sends an Endpoint Ready (ERDY) to the host which then reschedules the transaction. The use of unicast and the limited amount of multicast packets, combined with asynchronous notifications, enables links that are not actively passing packets to be put into reduced power states, which allows better power management. The "SuperSpeed" bus provides for a transfer mode at a nominal rate of 5.0 Gbit/s, in addition to the three existing transfer modes. Accounting for the encoding overhead, the raw data throughput is 4 Gbit/s, and the specification considers it reasonable to achieve 3.2 Gbit/s (400 MB/s) or more in practice. All data is sent as a stream of eight-bit (one-byte) segments that are scrambled and converted into 10-bit symbols via 8b/10b encoding; this helps the receiver to decode correctly even in the presence of electromagnetic interference (EMI). Scrambling is implemented using a free-running linear feedback shift register (LFSR). The LFSR is reset whenever a COM symbol is sent or received. Unlike previous standards, the USB 3.0 standard does not specify a maximum cable length, requiring only that all cables meet an electrical specification: for copper cabling with AWG 26 wires, the maximum practical length is 3 meters (9.8 ft). The term "available current" can be misunderstood. It implies that if a low power device or a USB2 device is connected to a USB3 port it can only draw 150 mA or 500 mA from that port. However, the available current for any USB device plugged into a USB3 port is 900 mA (unless it is charging port compliant) as defined by the USB3 spec. The actual current draw is determined by the device capability. The Vbus, pin 1, and Ground, pin 4, are the same for USB 1, 2, or 3. A USB2 HDD with 2 USB2 connectors needing a total of 800 mA will draw full power from a single USB3 port. A USB2 phone will probably charge faster since 900 mA is "available" to it. The USB 3.0 Promoter Group announced on 17 November 2008 that the specification of version 3.0 had been completed and had made the transition to the USB Implementers Forum (USB-IF), the managing body of USB specifications. This move effectively opened the specification to hardware developers for implementation in future products. The first USB 3.0 consumer products were announced and shipped by Buffalo Technology in November 2009, while the first certified USB 3.0 consumer products were announced on 5 January 2010, at the Las Vegas Consumer Electronics Show (CES), including two motherboards by ASUS and Gigabyte Technology. Manufacturers of USB 3.0 host controllers include, but are not limited to, Renesas Electronics, Fresco Logic, ASMedia, Etron, VIA Technologies, Texas Instruments, NEC and Nvidia. As of November 2010, Renesas and Fresco Logic have passed USB-IF certification. Motherboards for Intel's Sandy Bridge processors have been seen with Asmedia and Etron host controllers as well. On 28 October 2010, Hewlett-Packard released the HP Envy 17 3D featuring a Renesas USB 3.0 host controller several months before some of their competitors. AMD worked with Renesas to add its USB 3.0 implementation into its chipsets for its 2011 platforms. [needs update] At CES2011, Toshiba unveiled a laptop called "Toshiba Qosmio X500" that included USB 3.0 and Bluetooth 3.0, and Sony released a new series of Sony VAIO laptops that would include USB 3.0. As of April 2011, the Inspiron and Dell XPS series were available with USB 3.0 ports, and, as of May 2012, the Dell Latitude laptop series were as well; yet the USB root hosts failed to work at SuperSpeed under Windows 8. On 11 June 2012, Apple announced new MacBook Airs and MacBook Pro with USB 3.0. Side connectors on a laptop computer. Left to right: USB 3.0 host, VGA connector, DisplayPort connector, USB 2.0 host. Note the additional pins on the top side of the USB 3.0 port. 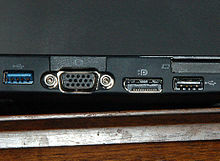 In laptop computers that lack USB 3.0 ports but have an ExpressCard slot, USB 3.0 ports can be added by using an ExpressCard-to-USB 3.0 adapter. Although the ExpressCard port itself is powered from a 3.3 V line, the connector also has a USB 2.0 port available to it (some express cards actually use the USB 2.0 interface rather than the true express card port). However, this USB 2.0 port is only capable of supplying the power for one USB 3.0 port. Where multiple ports are provided on the express card, additional power will need to be provided. Some ExpressCard-to-USB 3.0 adapters may connect by a cable to an additional USB 2.0 port on the computer, which supplies additional power. The ExpressCard may have a socket for an external power supply. If the external device has an appropriate connector, it can be powered by an external power supply. USB 3.0 port provided by an ExpressCard-to-USB 3.0 adapter may be connected to a separately-powered USB 3.0 hub, with external devices connected to that USB 3.0 hub. On the motherboards of desktop PCs which have PCI Express (PCIe) slots (or the older PCI standard), USB 3.0 support can be added as a PCI Express expansion card. In addition to an empty PCIe slot on the motherboard, many "PCI Express to USB 3.0" expansion cards must be connected to a power supply such as a Molex adapter or external power supply, in order to power many USB 3.0 devices such as mobile phones, or external hard drives that have no power source other than USB; as of 2011, this is often used to supply two to four USB 3.0 ports with the full 0.9 A (4.5 W) of power that each USB 3.0 port is capable of (while also transmitting data), whereas the PCI Express slot itself cannot supply the required amount of power. If faster connections to storage devices are the reason to consider USB 3.0, an alternative is to use eSATAp, possibly by adding an inexpensive expansion slot bracket that provides an eSATAp port; some external hard disk drives provide both USB (2.0 or 3.0) and eSATAp interfaces. To ensure compatibility between motherboards and peripherals, all USB-certified devices must be approved by the USB Implementers Forum (USB-IF). At least one complete end-to-end test system for USB 3.0 designers is available on the market. The USB Promoter Group announced the release of USB 3.0 on November 2008. On 5 January 2010, USB-IF announced the first two certified USB 3.0 motherboards, one by Asus and one by Gigabyte. [a] Previous announcements included Gigabyte's October 2009 list of seven P55 chipset USB 3.0 motherboards, and an ASUS motherboard that was cancelled before production. Commercial controllers were expected to enter into volume production in the first quarter of 2010. On 14 September 2009, Freecom announced a USB 3.0 external hard drive. On 4 January 2010, Seagate announced a small portable HDD bundled with an additional USB 3.0 ExpressCard, targeted for laptops (or desktops with ExpressCard slot addition) at the CES in Las Vegas Nevada. The Linux kernel mainline contains support for USB 3.0 since version 2.6.31, which was released in September 2009. FreeBSD supports USB 3.0 since version 8.2, which was released in February 2011. Windows 8 was the first Microsoft operating system to offer built in support for USB 3.0. In Windows 7 support was not included with the initial release of the operating system. However, drivers that enable support for Windows 7 are available through websites of hardware manufacturers. Intel released its first chipset with integrated USB 3.0 ports in 2012 with the release of the Panther Point chipset. Some industry analysts have claimed that Intel was slow to integrate USB 3.0 into the chipset, thus slowing mainstream adoption. These delays may be due to problems in the CMOS manufacturing process, a focus to advance the Nehalem platform, a wait to mature all the 3.0 connections standards (USB 3.0, PCIe 3.0, SATA 3.0) before developing a new chipset, or a tactic by Intel to favor its new Thunderbolt interface. Apple, Inc. announced laptops with USB 3.0 ports on 11 June 2012, nearly four years after USB 3.0 was finalized. AMD began supporting USB 3.0 with its Fusion Controller Hubs in 2011. Samsung Electronics announced support of USB 3.0 with its ARM-based Exynos 5 Dual platform intended for handheld devices. Various early USB 3.0 implementations widely used the NEC/Renesas µD72020x family of host controllers, which are known to require a firmware update to function properly with some devices. A factor affecting the speed of USB storage devices (more evident with USB 3.0 devices, but also noticeable with USB 2.0 ones) is that the USB Mass Storage Bulk-Only Transfer (BOT) protocol drivers are generally slower than the USB Attached SCSI protocol (UAS[P]) drivers. On some old (2009–2010) Ibex Peak-based motherboards, the built-in USB 3.0 chipsets are connected by default via a 2.5 GT/s PCI Express lane of the PCH, which then did not provide full PCI Express 2.0 speed (5 GT/s), so it did not provide enough bandwidth even for a single USB 3.0 port. Early versions of such boards (e.g. the Gigabyte Technology P55A-UD4 or P55A-UD6) have a manual switch (in BIOS) that can connect the USB 3.0 chip to the processor (instead of the PCH), which did provide full-speed PCI Express 2.0 connectivity even then, but this meant using fewer PCI Express 2.0 lanes for the graphics card. However, newer boards (e.g. Gigabyte P55A-UD7 or the Asus P7P55D-E Premium) used a channel bonding technique (in the case of those boards provided by a PLX PEX8608 or PEX8613 PCI Express switch) that combines two PCI Express 2.5 GT/s lanes into a single PCI Express 5 GT/s lane (among other features), thus obtaining the necessary bandwidth from the PCH. USB 3.0 devices and cables may interfere with wireless devices operating in the 2.4 GHz ISM band. This may result in a drop in throughput or complete loss of response with Bluetooth and Wi-Fi devices. Various strategies can be applied to resolve the problem, ranging from simple solutions such as increasing the distance of USB 3.0 devices from Wi-Fi routers and Bluetooth devices, to applying additional shielding around internal computer components. There were some devices (for example Vivo Xplay 3S) which were promised to come with USB 3.0, however, ultimately didn't ship with USB 3.0, because of manufacturers' inability to resolve the electromagnetic interference caused by the USB 3.0. A USB 3.0 Standard-A receptacle accepts either a USB 3.0 Standard-A plug or a USB 2.0 Standard-A plug. Conversely, it is possible to plug a USB 3.0 Standard-A plug into a USB 2.0 Standard-A receptacle. This is a principle of backward compatibility. The Standard-A is used for connecting to a computer port, at the host side. A USB 3.0 Standard-B receptacle accepts either a USB 3.0 Standard-B plug or a USB 2.0 Standard-B plug. Backward compatibility applies to connecting a USB 2.0 Standard-B plug into a USB 3.0 Standard-B receptacle. 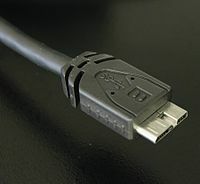 However, it is not possible to plug a USB 3.0 Standard-B plug into a USB 2.0 Standard-B receptacle, due to a physically larger connector. The Standard-B is used at the device side. 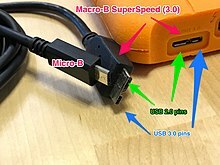 USB 3.0 also introduced a new Micro-B cable plug, which consists of a standard USB 1.x/2.0 Micro-B cable plug, with an additional 5-pin plug "stacked" inside it. That way, the USB 3.0 Micro-B host connector preserved its backward compatibility with the USB 1.x/2.0 Micro-B cable plugs. However, it is not possible to plug a USB 3.0 Micro-B plug into a USB 2.0 Micro-B receptacle, due to a physically larger connector. To be perfectly clear, you can run a device with a USB3 Micro-B socket on a USB2 Micro-B cable at USB2 speeds. 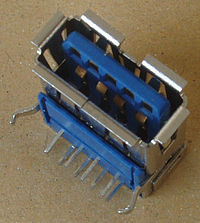 The connector has the same physical configuration as its predecessor but with five more pins. The VBUS, D−, D+, and GND pins are required for USB 2.0 communication. The additional USB 3.0 pins are two differential pairs and one ground (GND_DRAIN). The two additional differential pairs are for SuperSpeed data transfer; they are used for full duplex SuperSpeed signaling. The GND_DRAIN pin is for drain wire termination and to control EMI and maintain signal integrity. USB 3.0 and USB 2.0 (or earlier) Type-A plugs and receptacles are designed to interoperate. USB 3.0 Type-B receptacles, such as those found on peripheral devices, are larger than in USB 2.0 (or earlier versions), and accept both the larger USB 3.0 Type-B plug and the smaller USB 2.0 (or earlier) Type-B plug. USB 3.0 Type B plugs are larger than USB 2.0 (or earlier) Type-B plugs; therefore, USB 3.0 Type-B plugs cannot be inserted into USB 2.0 (or earlier) Type-B receptacles. Micro USB 3.0 (Micro-B) plug and receptacle are intended primarily for small portable devices such as smartphones, digital cameras and GPS devices. The Micro USB 3.0 receptacle is backward compatible with the Micro USB 2.0 plug. A receptacle for eSATAp, which is an eSATA/USB combo, is designed to accept USB Type-A plugs from USB 2.0 (or earlier), so it also accepts USB 3.0 Type-A plugs. In January 2013 the USB group announced plans to update USB 3.0 to 10 Gbit/s (1.25 GB/s). The group ended up creating a new USB specification, USB 3.1, which was released on 31 July 2013, replacing the USB 3.0 standard. The USB 3.1 specification takes over the existing USB 3.0's SuperSpeed USB transfer rate, also referred to as USB 3.1 Gen 1, and introduces a faster transfer rate called SuperSpeed USB 10 Gbps, referred to as USB 3.1 Gen 2, putting it on par with a single first-generation Thunderbolt channel. The new mode's logo features a caption stylized as SUPERSPEED+. The USB 3.1 Gen 2 standard increases the maximum data signaling rate to 10 Gbit/s (1.25 GB/s), double that of SuperSpeed USB, and reduces line encoding overhead to just 3% by changing the encoding scheme to 128b/132b. The first USB 3.1 Gen 2 implementation demonstrated real-world transfer speeds of 7.2 Gbit/s. USB 3.1 Gen 1 - SuperSpeed, 5 Gbit/s (0.625 GB/s) data signaling rate over 1 lane using 8b/10b encoding; the same as USB 3.0. USB 3.1 Gen 2 - SuperSpeed+, new 10 Gbit/s (1.25 GB/s) data rate over 1 lane using 128b/132b encoding. This rebranding of USB 3.0 as "USB 3.1 Gen 1" allows manufacturers to advertise products with transfer rates of only 5 Gbit/s as "USB 3.1," omitting the generation. On 25 July 2017, a press release from the USB 3.0 Promoter Group detailed a pending update to the USB Type-C specification, defining the doubling of bandwidth for existing USB-C cables. Under the USB 3.2 specification, existing SuperSpeed certified USB-C 3.1 Gen 1 cables will be able to operate at 10 Gbit/s (up from 5 Gbit/s), and SuperSpeed+ certified USB-C 3.1 Gen 2 cables will be able to operate at 20 Gbit/s (up from 10 Gbit/s). The increase in bandwidth is a result of multi-lane operation over existing wires that were intended for flip-flop capabilities of the USB-C connector. USB 3.2 Gen 1×1 - SuperSpeed, 5 Gbit/s (0.625 GB/s) data signaling rate over 1 lane using 8b/10b encoding, the same as USB 3.1 Gen 1 and USB 3.0. USB 3.2 Gen 1×2 - SuperSpeed+, new 10 Gbit/s (1.25 GB/s) data rate over 2 lanes using 8b/10b encoding. USB 3.2 Gen 2×1 - SuperSpeed+, 10 Gbit/s (1.25 GB/s) data rate over 1 lane using 128b/132b encoding, the same as USB 3.1 Gen 2. USB 3.2 Gen 2×2 - SuperSpeed+, new 20 Gbit/s (2.5 GB/s) data rate over 2 lanes using 128b/132b encoding. In May 2018, Synopsys demonstrated the first USB 3.2 Gen 2x2 connection, where a Windows PC was connected to a storage device, reaching a speed of 1.6 GB/s average. USB 3.2 is supported with the default Windows 10 USB drivers and in Linux Kernel 4.18. ^ "Intel Universal Serial Bus (USB) Frequently Asked Questions (FAQ)". Intel Corporation. Retrieved 26 December 2014. ^ "Universal Serial Bus Revision 3.1 Specification". usb.org. pp. 5–20. Archived from the original (ZIP) on 12 April 2016. Retrieved 12 April 2016. ^ McFedries, Paul (2013). "Connecting USB Devices". PCs for Grown-Ups: Getting the Most Out of Your Windows 8 Computer. Indianapolis: Que Publishing. ISBN 978-0-13-303501-8. Retrieved 2016-02-18. Most PC manufacturers label each USB port using the logo for USB type [...] the USB 2.0 logo is a trident, while the USB 3.0 logo is a similar trident with the letters 'SS' (which stands for SuperSpeed) attached. ^ a b "USB 3.1 Specification Language Usage Guidelines from USB-IF" (PDF). Archived from the original (PDF) on 12 March 2016. Retrieved 10 March 2016. ^ "USB 3.1 Gen 1 & Gen 2 explained". msi.com. ^ "USB 3.2 Specification". usb.org. USB Implementers Forum, Inc. Retrieved 30 August 2018. ^ "Universal Serial Bus Revision 3.1 Specification". usb.org. Archived from the original (ZIP) on 21 November 2014. Retrieved 19 November 2014. ^ Engbretson, Mike (January 2009). "USB 3.0 Physical Layer Measurements". Evaluation Engineering. Retrieved 2013-01-31. ^ "USB 3.0 Technology" (PDF). hp.com. 2012. Retrieved 2014-01-02. ^ a b c d "Universal Serial Bus Revision 3.0 Specification". Retrieved 2014-05-19. ^ Jan Axelson. "USB 3.0 Developers FAQ". janaxelson.com. Retrieved 2018-11-15. ^ "USB Power Delivery Specification 1.0" (PDF). Retrieved 2015-11-14. ^ "USB‐IF" (PDF). Archived from the original (PDF) on 31 March 2010. Retrieved 22 June 2010. ^ "First Certified USB 3.0 Products Announced". PC World. 2010-01-07. Retrieved 2010-06-22. ^ "USB-IF announces second certified USB 3.0 host controller" (Press release). USB Implementers Forum, Inc. 2010-11-16. Retrieved 2018-08-30. ^ "USB 3". Lecroy. Retrieved 2010-06-22. ^ "First Certified Superspeed USB Consumer Products Announced" (PDF) (Press release). USB-IF. 2010-01-05. Archived from the original (PDF) on 2010-01-14. ^ Gibabyte, TW [dead link]. ^ "Asus cancels its first usb 3.0 motherboard". The Inquirer. Retrieved 2010-06-22. ^ "Digitimes". 2009-04-15. Retrieved 2010-06-22. ^ "Freecom.com". Archived from the original on 17 June 2010. Retrieved 2010-06-22. ^ Ngo, Dong (2010-01-05). "Seagate ships USB 3.0-based external hard-drive kit for laptops | CES". CNET. Retrieved 2010-06-22. ^ "BlackArmor PS 110 with USB 3.0 | Portable Hard Drive for Business with Backup Software". Seagate. Archived from the original on 2010-08-15. Retrieved 2014-01-18. ^ "Kernel newbies". 2009-09-09. Retrieved 2010-06-22. ^ "Erste USB 3.0 Treiber" [First USB 3 drivers coming with Linux 2.6.31]. DE: Heise. 2009-12-03. Retrieved 2010-06-22. ^ "First driver for USB 3.0". Linux magazine. 2009-06-09. Retrieved 2010-06-22. ^ "FreeBSD 8.2-RELEASE Release Notes". freebsd.org. 2013-11-13. Retrieved 2015-08-05. ^ Bob McVay (2011-09-15). "Understanding USB 3.0 in Windows 8 | BUILD2011 | Channel 9". Channel9.msdn.com. Retrieved 2014-01-19. ^ "USB in MS Windows 7 more reliable, but no 3.0 speed boost". APC Mag. Retrieved 2010-06-22. ^ Crothers, Brooke (2010-04-07). "Long delay expected for Intel support of USB 3.0 | Nanotech - The Circuits Blog - CNET News". News.cnet.com. Retrieved 2014-01-19. ^ Paul Mah (2009-10-23). "Fiercecio.com". Fiercecio.com. Retrieved 2010-06-22. ^ "FAQ — PCI Express 3.0". PCI SIG. 2009-07-01. Retrieved 2010-06-22. ^ "PCIe 3.0 Specification Coming Soon". Enterprise storage forum. 2010-05-05. Retrieved 2010-06-22. ^ "Intel delays USB 3.0 support until 2011". Techspot. 2009-10-22. Retrieved 2010-06-22. ^ TeamVR (23 August 2011). "USB 3.0 Speed Tests: 7-Way Host Controllers Roundup - Page 5 of 11". Vr-zone.com. Retrieved 2014-01-19. ^ "USB 3.0: Renesas Electronics* USB 3.0 Firmware Updates". Downloadcenter.intel.com. Retrieved 2014-01-19. These firmware updates resolve the following issues related to the USB 3.0 ports on these boards: • BIOS and operating system do not detect devices attached to the USB 3.0 ports. • System hangs on POST code 58 for one minute if any device is attached to USB 3.0 ports, and then continues the boot process. • In Device Manager, the Renesas* USB 3.0 eXtensible Host Controller is shown with a yellow bang and the error message "Windows has stopped this device because it has reported problems. Code 43". ^ "NEC uPD720200 USB 3.0 not working on Ubuntu 12.04". Ask Ubuntu. Retrieved 2014-01-19. ^ "How to improve the compatibility of USB3.0 devices?". Gigabyte. Retrieved 2014-01-19. ^ Lars-Göran Nilsson (2010-07-30). "Gigabyte adds UASP support to its USB 3.0 motherboards". SemiAccurate. Retrieved 2014-01-19. ^ Lars-Göran Nilsson (2010-08-11). "Gigabyte's UASP USB 3.0 driver boosts USB 2.0 performance". SemiAccurate. Retrieved 2014-01-19. ^ Andrew Ku (2012-06-19). "USB Attached SCSI (UAS): Enabling Even Better USB 3.0 Performance - Faster USB 3.0 Performance: Examining UASP And Turbo Mode". Tomshardware.com. Retrieved 2014-01-19. ^ Hamid, Adnan (2012-03-18). "What's the Difference Between USB UASP And BOT | Embedded content from". Electronic Design. Retrieved 2014-01-22. ^ Thomas Soderstrom (2009-12-09). "New Motherboards From Asus And Gigabyte - USB 3.0 Performance: Two Solutions From Asus And Gigabyte". Tomshardware.com. Retrieved 2014-01-22. ^ Patrick Schmid and Achim Roos (2010-08-26). "Gigabyte P55A-UD6 And UD7 (NEC PD720200) - Not All USB 3.0 Implementations Are Created Equal". Tomshardware.com. Retrieved 2014-01-22. ^ Lynn, Samara (2013-09-05). "Wireless Witch: The Truth About USB 3.0 and Wi-Fi Interference". PCMag.com. Retrieved 2014-07-14. ^ "SuperSpeed USB (USB 3.0) Performance to Double with New Capabilities" (PDF) (Press release). Implementers Forum. 6 January 2013. Archived from the original (PDF) on 13 January 2013. ^ "SuperSpeed USB 10 Gbps – Ready for Development" (PDF) (Press release). Hillsboro, Ore. July 31, 2013. Archived from the original (PDF) on 2016-01-27. ^ a b c "USB Logo Usage Guideline" (PDF). www.usb.org. Retrieved 2019-02-27. ^ "SuperSpeed USB 10 Gbps - Ready for Development". Rock Hill Herald. Archived from the original on 11 October 2014. Retrieved 31 July 2013. ^ "Synopsys Demonstrates Industry's First SuperSpeed USB 10 Gbps Platform-to-Platform Host-Device IP Data Transfer" (Press release). Mountain View, California: Synopsys. 2013-12-10. Retrieved 2013-12-23. As measured by the Ellisys USB Explorer Protocol Analyzer, the IP realized 10 Gbps USB 3.1 effective data rates of more than 900 MBps between two Synopsys HAPS-70 FPGA-based prototyping systems while using backward compatible USB connectors, cables and software. ^ Bright, Peter. "USB 3.2 is going to make the current USB branding even worse". Ars Technica. Retrieved 27 February 2019. ^ Saunders, Brad; Nardozza, Liz (25 July 2017). "USB 3.0 Promoter Group Announces USB 3.2 Update" (PDF). USB.org. USB 3.0 Promoter Group. Archived from the original (PDF) on 21 September 2017. Retrieved 27 July 2017. ^ Bright, Peter (26 July 2017). "USB 3.2 will make your cables twice as fast... once you've bought new devices". Ars Technica. Retrieved 27 July 2017. ^ a b "Synopsys Shows World's First USB 3.2 Demo With 20Gbps Speeds". Tom's Hardware. 2018-05-25. Retrieved 2018-05-27. ^ "USB 3.2 Work Is On The Way For The Linux 4.18 Kernel - Phoronix". www.phoronix.com. Retrieved 2018-05-27. ^ "USB 3.1 Legacy Connectors and Cable Assemblies Compliance Document Rev 1.1 | USB-IF". usb.org. Retrieved 2019-02-27. Wikimedia Commons has media related to USB 3.0.